We’ve curated a menu of services that includes acupuncture, massage, and beauty treatments delivered by our collective of independent wellness practitioners for an experience that’s part therapeutic, part indulgence, and wholly transformative. Mini acupuncture sessions are offered as a monthly event. This treatment is done in a group setting while still allowing for individualized treatment. Benefits include pain relief as well as deep relaxation and lowering of stress levels. Accepts Aetna, Carefirst/Blue Cross Blue Shield, and Cigna insurances. 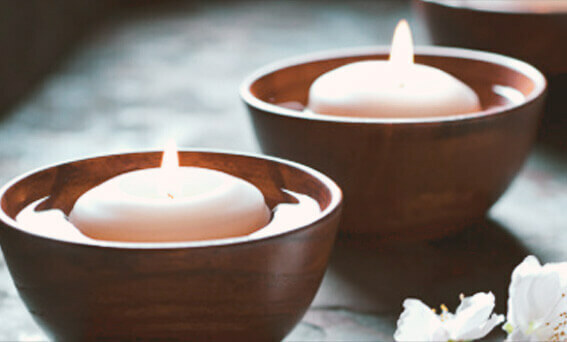 2 hr | $210 This personalized massage experience is tailored to meet your individual needs. The therapist utilizes a blend of modalities that can include Swedish, Deep Tissue, and Myofascial Release. Enjoy warm stones to ease muscle tension, hot towels, aromatherapy, and the healing benefits of the BioMat. This massage is considered a reset button for your emotional, mental, and physical well-being. 30 min | $60 The therapist will apply pressure to reflex points on your feet which correspond to all of your body’s organ systems. 45 min | $85 The Aroma Touch technique incorporates pure therapeutic grade essential oils, and relaxing hand techniques, to create a powerful holistic full-body experience. The goal of this treatment is to return the body to a state of balance; homeostasis. 30 min | $75 Experience a soothing treatment when you are short on time. The stress will melt away, and the only thing you need to take off is your shoes and socks. 30 min | $60 Our feet are tireless workers that accumulate tension, stress, and fatigue. By treating the feet well you will feel relaxed, grounded, and energized. 15 min | $25 Perfect for those who deserve some time out of their busy schedule, providing the body with some much needed rejuvenation. 90 min | $200 Stones and massage are unified in this impressive warm-to-the-core composition. Massage treatments can include hot stones, hot towels, heat wraps, and aromatherapy. 90 min | $130 A multi level exfoliation treatment completely customized for your skin type in a warm, relaxing setting. This treatment will leave your skin fresh, hydrated and radiant. 45 min | $80 A cleansing and pampering treatment for the hardest place to reach on your body. This treatment will cleanse and exfoliate the skin, while treating to reveal smooth, rejuvenated skin. 45 min | $75 This is an intense exfoliation treatment that removes fine, vellus hairs from the skin’s surface. It promotes increased product penetration and softens the appearance of fine lines and wrinkles, or for those suffering from an uneven skin tone. 90 min | $140 This treatment provides ultimate exfoliation and rejuvenation for your skin. Best paired with our customized wellness facial, this treatment will leave you feeling completely relaxed. This treatment uses light energy to improve cellular health and regulate cellular function. The blue light reduces inflammation and kills bacteria, and the red light helps fight wrinkles and fine lines. The infrared light helps reduce inflammation, which is good for those who suffer from pain. 45 min | $75 This skin rejuvenating treatment uses a minimally abrasive instrument to gently sand your skin and remove the uneven outer layer. Stimulation alone boosts blood circulation and revitalizes collagen production, which leads to the regrowth of newer, younger looking skin. 90 min | $140 This skin rejuvenating treatment uses a minimally abrasive instrument to gently sand your skin and remove the uneven outer layer. Stimulation alone boosts blood circulation and revitalizes collagen production, which leads to the regrowth of newer, younger looking skin. 60 min | $90 This treatment will detoxify and remove blemishes that are clogging the pores, a great treatment for teenage skin. You will also receive guidance on how to prevent future breakouts. Level 3 | $130 Level 1: Light peel, formulated for sensitive skin. Improves skin surface texture while also brightening. Level 2: Mid-level potency. Evens skin tone, improves texture and brightens. Post Kit included. Level 3: Most potent. Extremely effective on sun damaged and thickened skin, heavy peeling can be expected. Post Kit included. by downloading the MINDBODY app. Their skills and expertise are unparalleled—no matter how you’re looking to unwind and reset. Rebecca King is a licensed acupuncturist in the state of Maryland, serving the greater Baltimore area. She received her Masters of Acupuncture degree from the Maryland University of Integrative Health. Rebecca King - L. Ac. Katie joins the Curio Wellness team with forty years of experience in massage therapy. She’s a graduate of the Baltimore School of Massage, a member of the American Massage Therapy Association, and is board certified. Jennifer Friedman is a graduate of the Holistic Massage Training Institute. She’s a member of the American Massage Therapy Association and is board certified. Robin is a Best of Baltimore winner for Best Facial and Best Waxing. She brings to the Spa at Curio Wellness over 24 years of experience in the skin care industry. She’s a graduate of Von Lee School of Esthetics, the International Dermal Institute in Virginia and the Baltimore School of Massage. Karie has been educated and trained by leading skincare and makeup companies. She participated in an extensive apprenticeship under Robin Ferro, lead esthetician in the skincare field. Karie also completed postgraduate education in skin and body therapy from The Dermal International Dermal Institute.